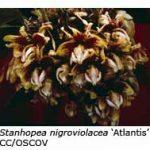 Around sixty Stanhopea species have been described. Their identification has been a contentious subject and based mainly on differences in the shape of the lip. However, through the expertise of Rudolf Jenny, their ease of identification has improved enormously in recent years. In many instances, the differences between species have been obvious but in others the differences are quite subtle. Only through the use of recent techniques, such as perfume analysis, have some species have been clearly identified. Stanhopea species are found in four different regions, namely, North Central America (Guatemala and Mexico), South Central America (Nicaragua, Costa Rica and Panama), the Andes and NE South America (Colombia, Ecuador, Peru, Bolivia and Venezuela) and SE South America (Brazil). Those found in North Central America prefer light shade, dry conditions and a fairly low minimum temperature (8-12°C). 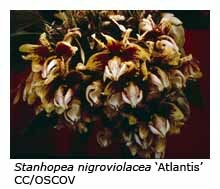 Commonly grown species include Stanhopea oculata, S. inodora and S. tigrina, including its variety nigroviolacea (often known as S. nigroviolacea), and S. wardii. Those species found in South Central America experience wet conditions all year, and prefer to be potted in sphagnum moss. Most of the ten species in this group require hot (min. temp. 20°C), shady conditions. Stanhopea costaricensis, S. ecornuta and S. warscewicziana are those species most commonly seen in cultivation. 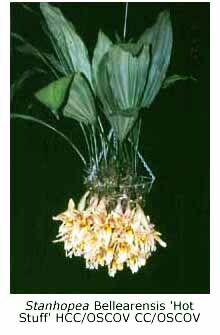 The largest group, found predominantly in the Andes and NE South America, prefers damp conditions and likes to be kept moist all year. Most species prefer a minimum temperature of 15°C. The smallest group, from Brazil, comprising S. guttulata, S. insignis and S. lietzii, prefers to be kept dry, provided with a minimum temperature of 15°C and given good light. Despite the above general recommendations, a minimum temperature of 12°C seems to be suitable for all of those species needing warmth that I grow. Generally, all stanhopea species require high humidity all year, low to moderate levels of light, fertiliser as per the general collection. My experience has been that two porting mixes are suitable for stanhopeas, namely, a ‘wet’ mix comprising equal parts of sphagnum moss and 10 mm perlite or a ‘damp to dry’ mix of three parts of seedling bark and one part of 50 mm perlite. The first mix is required for plants that need high moisture, while the second mix is suitable for plants requiring less moisture. Despite claims to the contrary, shallow baskets are not required for many species. A large basket full of S. wardii recently produced at least eight spikes from the deeper sections of the basket. In some species, spikes will emerge over the edge of the basket one year and the next season emerge through the paper bark liner several centimetres lower. Baskets are time-consuming to prepare, and I have found black plastic slot pots (125 mm and 200 mm) to be useful alternatives. They are much easier to manage when re-potting and I have found that stanhopea flower spikes have no difficulty in finding their way through the slots. 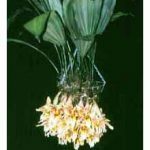 When re-potting, I recommend that the plant be stabilised with a length of plastic-coated wire passed over the top of the pseudo-bulbs and secured to the sides of the container at least 25 mm below its top. For bush-house growers and those in Melbourne with shady trees to hang their plants under, there are a number of suitable species, for example, S. graveolens, S. hernandezii, S. inodora, S. pozoi, S. tigrina, S. tigrina var. nigroviolacea, S. wardii, S. wardii var. aurea, S. oculata and S. oculata var. ornatissima.